Music Students’ Service League (MSSL) is a group of self-governing MTAC student volunteers dedicated to serving their community through music. Through their involvement in MSSL, the students develop leadership skills and nurture the lifelong habit of service. Projects include MTAC WLA’s annual Daniel Pearl World Music Days Concert, fundraisers for music-related organizations, student performances at senior citizen homes, and mentoring younger students. WLA MSSL has worked with the Westside Music Foundation, Neighborhood Music School, Harmony Project, and the Academy of Music for the Blind, among others, to raise funds for music education programs in the local community for underserved children and youths. If requested, students may receive community service credit toward the hours required by their respective schools for graduation. Membership in MSSL helps music students discover purpose and relevance in their study. To nurture the lifelong habit of community service, sharing one’s time and talent in a thoughtful manner for the good of another or the community as a whole. 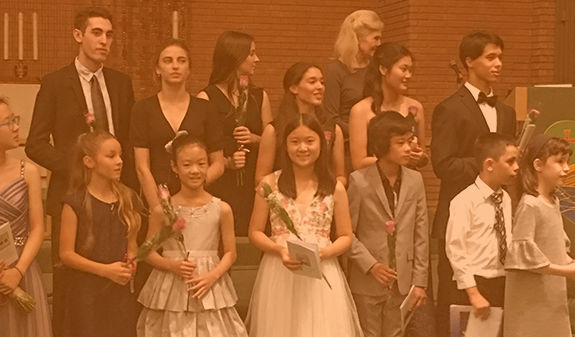 The name of this organization shall be Music Students’ Service League of West Los Angeles (MSSL-WLA), a student auxiliary of the West Los Angeles Branch of the Music Teachers’ Association of California (MTAC-WLA). The members of MSSL must be in seventh grade or higher and currently studying with a teacher member of the MTAC-WLA Branch. Exceptions will be made on a case by case basis for motivated sixth graders. To join, students should speak with their teachers, access mtacwla.org, and follow the instructions on the website. All members of MSSL in good standing shall be able to take part in all activities and to hold office. To hold office candidates must have been an active member in good standing at least six months. Active membership requires attendance at one or more general meetings during the current year and participation in at least one event. Participation includes event production as well as performing. A member in good standing follows the MSSL Bylaws and acts according to the MSSL Code of Conduct. Officers may serve for one year. If there are no volunteers for an office then an exception may be made for an officer to serve in the same office for a second year. A member may resign by notifying the Director of Communications in writing, either by email or post. The MTAC-WLA MSSL Project Chairs would present the situation for review at a Board meeting. Subsequently the executive board of MTAC-WLA, by a majority vote, may suspend or revoke the membership of any MSSL member violating the MSSL bylaws, or the Code of Conduct, or acting in any manner harmful to MSSL or to MTAC-WLA. The elected officers shall conduct the routine business of MSSL as detailed below, and shall constitute its Board of Directors. Shall work closely with faculty advisors to oversee the workings of MSSL. Shall work closely with the president to oversee the workings of MSSL. Shall oversee projects by directing the work of the program directors. Shall organize phoning the membership if necessary. Shall appoint another member to take minutes in the secretary’s absence; Shall make the minutes and records available to members upon request; Shall write letters and other communications as necessary. Shall keep a record of all MSSL activities including minutes, printed programs, membership rosters, lists of officers, and photographs. Shall organize and direct MSSL projects as designated by the board. Any officer absent for more than two consecutive meetings without valid reason shall, after due notice, be relieved of office. A vacancy among the officers shall be filled for the unexpired term by a vote of the remaining officers at a board meeting within thirty (30) days after such a vacancy has occurred. Active members in good standing and seeking office may apply by submitting a written candidate’s statement by the second Friday of April. Online voting will begin one week after the meeting at which speeches shall be read, and will close three weeks later. The new Board members will be announced at our final meeting and subsequently posted on the website. The term of office will be July 1 – June 30. At least three general meetings shall be held from September to June inclusive, dates to be decided by the Board. Special meetings may be called by the President or the Board, and shall be called on request of five members, provided that seven days’ notice is given to all members. Only business stated in the notice may be considered. The quorum for a meeting shall be half the membership plus one, including four officers. The latest edition of “Roberts’ Rules of Order, Newly Revised” shall govern MSSL, unless otherwise provided for in these bylaws. The MSSL bylaws conform to [MTAC-WLA] bylaws as revised June 6, 2006. The MSSL bylaws may be amended by a two-thirds vote of those MSSL members present at a regular meeting or by email, after notification that the said amendments would be available to every member 30 days before election. Respect the dignity and work of fellow students and teachers; Encourage members towards fulfillment of their musical potential.